1923: (Julian Don) Alexander Film Co, 3385 So Broadway, Englewood CO. 1924: Purchase of Longren Aircraft Co as Alexander Industries, and Alexander Flying School. 1925: Alexander Aircraft Co; 1928: Colorado Springs CO. 1932: Aircraft operations into bankruptcy. 1934: Reorganized as Aircraft Mechanics Inc (fdr: Proctor W Nichols, W F Theis), 3200 N Nevada St, Colorado Springs. B-1 1930 = Alexander's popular glider fitted with a Henderson motorcycle engine. POP: unknown, but one registered might be the only powered version of many gliders [602W] c/n 101. Bullet C 1929 = 3-4pClwM rg; 120hp Anzani, replaced by 100hp Kinner; span: 38'7" length: 21'1" v: 140/120/40 range: 612; ff: 1/12/29 (p: Ted Haeuter, Al Mooney). Al Mooney, Max Munk (of NACA), Ludwig Muther. POP: 1 prototype [X6390] c/n 1. In all, 12 Bullets were built and 4 partially completed. Bullet C-1, -3 1929 = 3-4pClwM rg; 100hp 150hp Wright J-6-5 ; span: 38'7" length: 21'6" load: 1098# v: 150/127/45 range: 612 ceiling: 15,000'. $6,500-7,200; POP: 2 as C-1 [X8227] c/n 2000 and [X8228] c/n 2001 with Kinner K-5 (length: 21'1" load: 1065# v: 130/111/42 range: 550 ceiling: 11,000') also seen in one reference as C-3. Bullet C-3 1930 = 4pClwM rg; Kinner K-5; span: 38'7" . POP: 1 racer for the 1930 Nationals [R8228] c/n 2001; dismantled. Bullet C-4, -5 1929 (ATC 2-181) = 4pClwM rg; 165hp Wright J-6; span: 38'7" length: 21'6" v: 150/128/x range: 600 ceiling: 15,000'. $8,888; POP: 8 [X700H (appears in regs as a C-4), R705H (as C-4), 732H, 741H, 747H, 761H, 771H, 774H (as C-4)]. Motor options 165hp Comet 7-E and Axelson B were never installed. Although flown successfully in many competitions by Edith Foltz and Errett Williams (hence the "R" licensing), C-5s were rough on test pilots. On 9/16/29 undefined problems arose during a test flight, and Errett Williams had to bail out, then L W Sylvester was killed 9/21/29 in a spin test. On 10/7/29, Shelly Charles was forced to bail out during a spin, and on 11/5/29, Lewis Love's plane failed to recover from a fatal spin. Bullet C-7 1930 (ATC 318, 2-181) = 4pClwM; 165hp Wright J-6; span: 36'0" length: 26'10" load: 1082# v: 148/125/48 range: 540 ceiling: 15,000'. $7,200, $6,500 by 1931; POP: 1 [NC309V] c/n 2013. The final sleeked-up version with longer fuselage, full-panted fixed gear, partly-cowled motor, and redesigned tail group. (2-181) superseded by (318). The first low-wing cbin monoplane to be granted an ATC, many of its design innovations are evident in Mooney's subsequent aircraft. Eaglerock (Alexander Film Co )1925 = 4pOB; 90hp Curtiss OX-5; ff: 9/19/25. 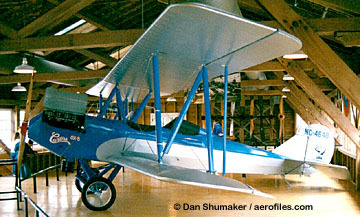 Daniel Noonan, extensively redesigned as A-1 by Al Mooney in 1926. 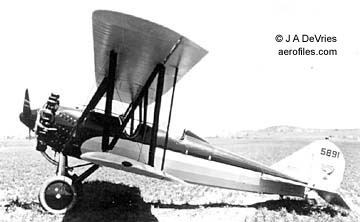 First Alexander Co design had folding wings, and Warren-truss wing struts with no wire rigging. POP: 1, based on surplus Longren components, it had problems with design and motor overheating. Name came about from an injured Golden Eagle cared for as a pet by factory employees, appended with "Rock," honoring the nearby Rocky Mountains. Eaglerock A-2 1926 (ATC 58) = 3pOB; 90hp Curtiss OX-5 with a chin radiator; span: 36'8" length: 24'11" load: 983# v: 99/85/34 range: 450. $2,475, $2,000 in 1929. Also available with 100hp Curtiss OXX-6. Eaglerock A-3 1928 (ATC 59) = 3pOB; 150hp Hisso A; length: 24'10" load: 741# v: 114/97/40 range: 475, or 180hp Hisso E; v: 120/103/40 range: 570. $3,250; POP: see next. Eaglerock A-4 1928 (ATC 59) = Same as A-3, but with 180hp Hisso E, and a nose radiator. POP total A-3 and -4: 93. Eaglerock A-5 1928 = 2pOB; 260hp Menasco-Salmson B-2; span: 36'8" length: 23'10". POP: 2 or 3. One as entry in the 1929 National Air Tour (p: Ben O Howard). Eaglerock A-7 1928 (ATC 2-1 (cancelled)) = 3pOB; 125hp Ryan-Siemens; span: 36'8". POP: 2 conversions [X4570, X4753], the first destroyed in a hangar fire, and Group 2 approval cancelled. Eaglerock A-11 1928 = 1pOB; 110hp Warner Scarab. 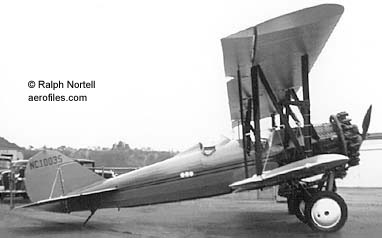 POP: 1 prototype [X6315], rebuilt as A-14, ended up with Mathewson Airways in Detroit, most likely serving as a mail plane. Eaglerock A-12 1929 (ATC 139, 2-1) = 3pOB; 130hp Comet 7-RA; length: 24'11" load: 953# v: 112/94/40 range: 650. Ludwig Muther (A-12 to A-15). $5,849; POP: 11, a few of which were refitted with 165hp Comet 7-E under reissued (2-1). Eaglerock A-13 1929 (ATC 141) = 3pOB; 170hp Curtiss twin-row Challenger; span: 36'8" length: 24'6" load: 945# v: 117/100/40 range: 600. $6,096; POP: 11. 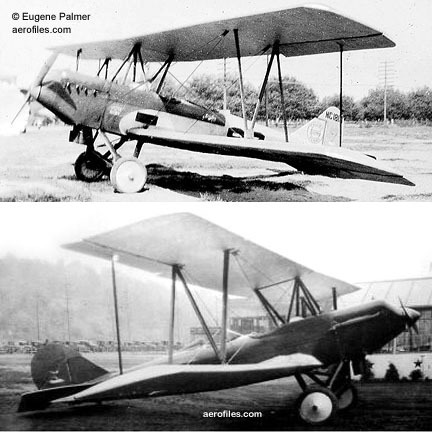 Eaglerock A-14 1930 (ATC 2-103) = 3pOB; 165hp Wright J-6; length: 25'11" load: 937# v: 118/108/40 range: 600. $2,000 less motor. POP: 14; 1 converted from A-11 [NC6315], another [203Y] might have been a conversion from an earlier model. Eaglerock A-15 1929 (ATC 190) = 3pOB; 100hp Kinner K-5; span: 36'8" length: 24'11" load: 917# v: 100/88/38 range: 500. Long-nose "Anteater" with a long motor mount. $4,157; $3,907 in 1930; POP: about 20; [NC6232] converted from A-2, [NC8294] was the prototype. Eaglerock Combo-Wing, Short-Wing 1926 (ATC 7) = 3pOB; 90hp Curtiss OX-5; span: 36'0" length: 24'11" load: 760# v: 100/85/38 range: 395. Offered as Short-Wing with 30'0" span. Also available with 100hp OXX-6. Won 2nd and 3rd places in the 1927 National Air Derby. $2,750; POP: see next. Eaglerock Long-Wing 1926 (ATC 8) = 3-4pOB; 90hp Curtiss OX-5; span: (upper:) 36'0" (lower) 38'0" length: 24'11" load: 760# v: 92/80/35 range: 380. Al Mooney, Daniel Noonan. This second design built by Alexander featured unequal spans. One powered by 220hp Wright J-5 for the 1927 Ford Air Tour. 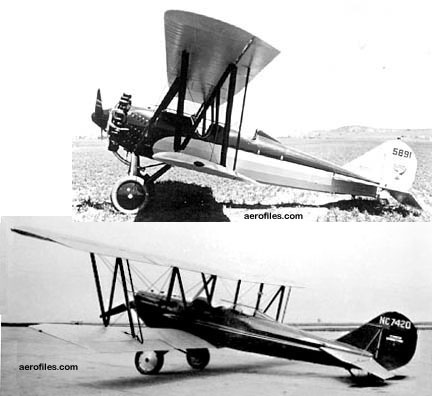 $2,750; POP total Combo-, Long-, and Short-Wing models: 205 built 1926-27, but subsequent production unrecorded. 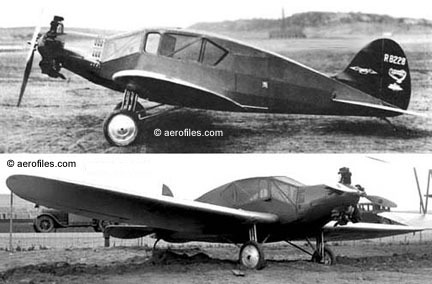 Some built by Aircraft Mechanics Inc.
Flyabout D-1 1931 (ATC 439) = 2pChwM; 40hp Continental A-40; span: 37'10" length: 21'9" load: 389# v: 80/70/28 range: 175. Proctor Nichols. Side-by-side cabin. $1,465; POP: 4; 1 unlicensed static test model, 1 prototype [X447V], and 2 converted to D-2 [NC528Y, NC11061]. Flyabout D-2, Aircraft Mechanics Flyabout D-2 1931, 1935 (ATC 449) = 2pChwM; 45hp Szekely SR-3; span: 37'10" length: 21'7" load: 392# v: 90/77/32. Larger fin and rudder. 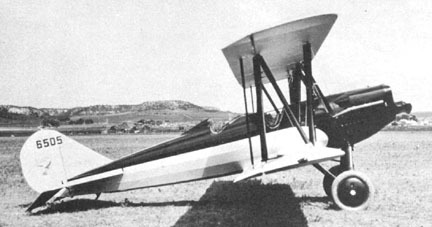 $1,590; POP: 17, of which 2 were converted from D-1. Aircraft Mechanics' improved 1935 production model varied slightly; length: 21'9" load: 399# v: 93/80/32 for $1,450. Hallett 1929 = A-2 with 130hp Hallett. POP: 3 [6354, 6359, 7981], converted to A-1. Longren 1924 = 2pOB; 60hp Anzani or Lawrance; span: 27'11" length: 19'7". Bakelite-type monocoque fuselage, folding wings. POP: 4 from Longren Aircraft Co inventory. Racer 1928 = 1-2pOB; 150hp Curtiss C-6A. POP: 1 modified-wing racer for the 1929 Nationals [X7187] (p: Reggie Sinclaire); it came in second in the 50-mile free-for-all event (v: 110). Sinclaire, an ex-Lafayette Escadrille SPAD pilot, was heir of the Corning Glass Co family. Sedan aka Cabin Cruiser 1927 = 8pChwM; 220hp Wright J-5; span: 52'0" load: 1890# range (est): 1000; ff: 12/10/27. George De Bell. POP: 1 [X6380] c/n 1 or B-1. Flown a few times, but the project was abandoned because of poor performance. The plane was stored, finally sold in 1939 for $150 and converted into a resort concession as "the world's fastest hot-dog stand." 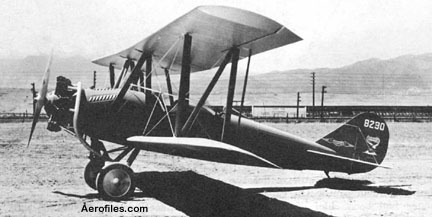 Swallow 1924 = Modified OX-5 Laird Swallow as the first Alexander product (c/n 1). Daniel Noonan. POP: 1, purchased from Nicholas Beazley Co and reportedly modified, although any major changes are not apparent in photos.